China’s government has spent 800 million yuan (US$126 million) to build two large advanced ferryboats to ply the Qiongzhou Strait, which separates Guangdong from the island province of Hainan. The two boats, dubbed Yuehaitie No.3 and No.4, have been underutilized since their completion despite the serious shortage of boats capable of withstanding force-8 winds. Two freight ferryboats, Yuehaitie No.1 and No.2, currently transport trains, buses and trucks across the strait 8-10 times a day but their transport capacity is overstretched by the growing transport load. the two new boats were built boasting larger capacity and more advanced functions. Yuehaitie No.3 was launched on April 8 this year to ferry trains but not buses and trucks due to the lack of operating permit. This has resulted in a waste of its available capacity, especially during typhoon weather. A truck driver points out that whenever typhoons come, cars queue in a long line waiting for a place on a ferry to cross the strait to become available, noticing that Yuehaitie No.3 sets sail with a large amount of unused space. On May 26, Yuehaitie No.4 arrived at its harbor terminal and has been docked there idle ever since. 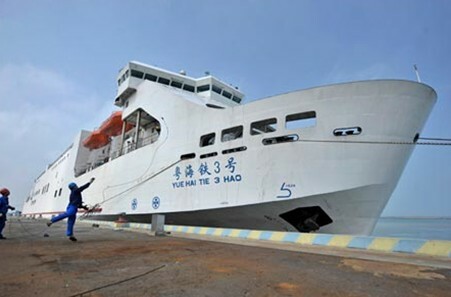 Insiders say that with the development of Hainan’s tourism industry, transport volume across the Qiongzhou Strait has been growing at an annual rate of 10% and the failure of the completed ferryboats to operate at full capacity constitutes a major problem. Feng Shaoqiu, a transportation official from the Hainan provincial government, points out that unlike Yuehaitie 1 and 2 which were built to transport both trains and cars, Yuehaitie 3 and 4 are intended mainly for the transport of trains. The Hainan provincial government subsequently proposed allowing Yuehaitie 3 and 4 extending their operational scope to the transport of cars but the Guangdong provincial government on the other end disagreed, citing sufficient transport capacity across the strait. An insider points out that large ferryboats can meet demand for transporting cars and commodities across the Qiongzhou Strait during bad weather. The obstruction for Yuehaitie 3 and 4 to operate at full capacity involves conflicts of municipal interests, constituting a major waste of national resources and impeding the development of Hainan’s international tourism.